This week, Susan and Kitty have used the Force to bind together the Top 10 Luke Skywalker Moments in Star Wars. Will they hit the target and save the galaxy, or is it time for these Jedi to end? While this moment is often joked about due to Luke’s whining over something trivial, it serves to show how little Luke knows about what lies in the galaxy beyond. It’s a reminder that one of the greatest heroes came from so little, and started the saga so simply as a farm boy. By the time we get to The Force Awakens, a new generation of heroes are stepping up into their own roles. Still, their exploits are inspired by the bravery of characters like General Organa, and of course, the legendary Jedi Luke Skywalker. This moment shows just how much of an impact Luke’s actions have had throughout the galaxy. 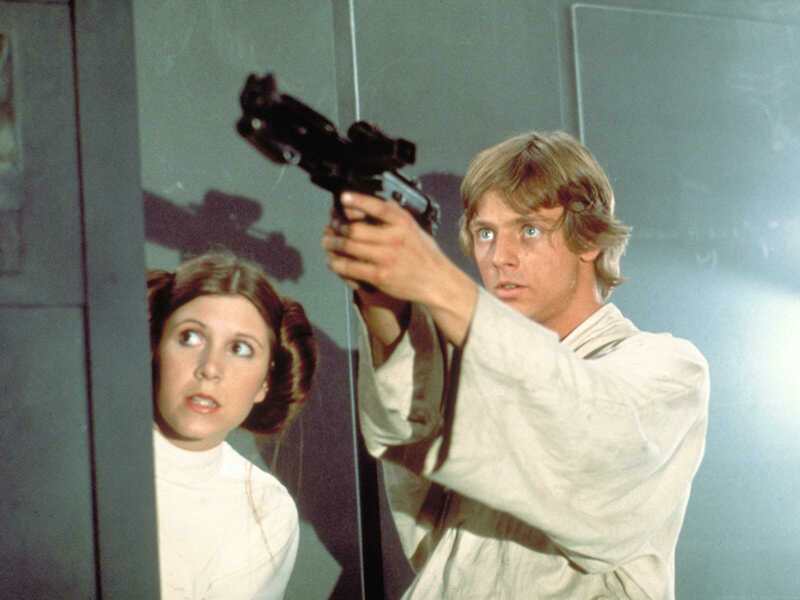 Luke begins to show the full scope of his Jedi abilities in Episode VI, tricking Bibb Fortuna into letting him inside Jabba’s gangster palace. This is a stylish and exciting time for Luke showing off the skill, resourcefulness, and heroism he’s honed throughout the trilogy thus far. No longer just a farm boy from Tatooine, here Luke has confidence in his abilities to aid the Rebellion in the destruction of the first Death Star. This bravery and assurance sets him on the path to ultimate heroism, proving that the galaxy’s heroes could come from anywhere, with hope and the willingness to do good. This quiet, contemplative scene begins to solidify the larger picture of the original Star Wars trilogy and the galaxy as fans knew it. Shot against the nighttime blues of Endor, Luke reveals his connection to both Vader and Leia, sharing a beautiful sibling connection before the ultimate face off against Vader. Training with Yoda on Dagobah was formative to Luke’s identity as a Jedi Knight, as well as a mature member of the galaxy at large. Overcoming his disbelief in what can be accomplished through the Force teaches him to let go and trust in his master’s teachings, allowing Luke to eventually become a skilled Jedi and galactic legend. This wordless scene is one of the most iconic shots in all of Star Wars, scored by the swelling sounds of the Force Theme, cementing the film’s status as a space opera. It’s a call to action for our hero Luke, but also for the viewers who are looking out into the binary sunset over Tatooine’s horizon, ready to discover what larger galaxy awaits beyond the sands. This moment in Star Wars: The Last Jedi showed Luke’s Jedi journey coming full circle, as he passes on his teachings in order to continue the legacy of the Jedi. He peacefully holds off the First Order’s onslaught, using all of the skills he has learned and honed over the years, also proving to Kylo Ren that there is much that the Dark Side cannot accomplish through brute strength alone. Moreso than any other display of his powers, this moment is when Luke truly embodies what it means to be a Jedi. He refuses to fight his father, Darth Vader, and redeems Anakin Skywalker while resisting the Emperor’s machinations and facing possible death. It is a moment filled with empathy and compassion, overcoming evil to honor the ways of the Jedi. This oft-quoted line is a fan-favorite, and within the trilogy itself it remains one of the most powerful declarations Luke Skywalker makes. Did you miss any of our previous episodes, including Top 10 Marvel Mutant Telepaths and Top 10 Superhero Headquarters? You can check out the full Geek Culture Countdown podcast on iTunes. Keep an eye out for new episodes and more ways to listen coming soon.